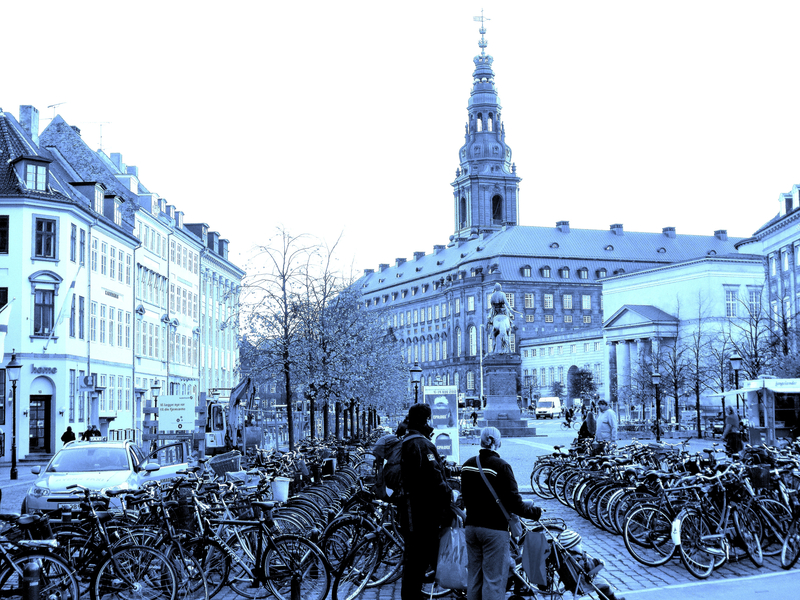 Bikes lined up in Copenhagen (image PradaDearest). A host of observers argue that cycling is saddled by a “culture of fear”: apparently terrified by warnings about the dangers of cycling, many people fear biking, and even disciplined riders seem compelled to wear bright clothing, confine themselves to bike lanes, and wear safety gear, such as helmets. Many of these commentators decry a “nanny state’s” construction of cycling as a “dangerous” activity that breeds fear to hawk commodities that will make us impervious to all possible threats. Mikael Colville-Andersen’s constructions of cyclists as the perfect aesthetic marriage of function, beauty, and style unmarred by an obtrusive helmet (image from Mikael Colville-Andersen). The most persistent volleys against helmets have come from Copenhagenize’s Mikael Colville-Andersen, who has been lobbying against helmets for most of a decade. 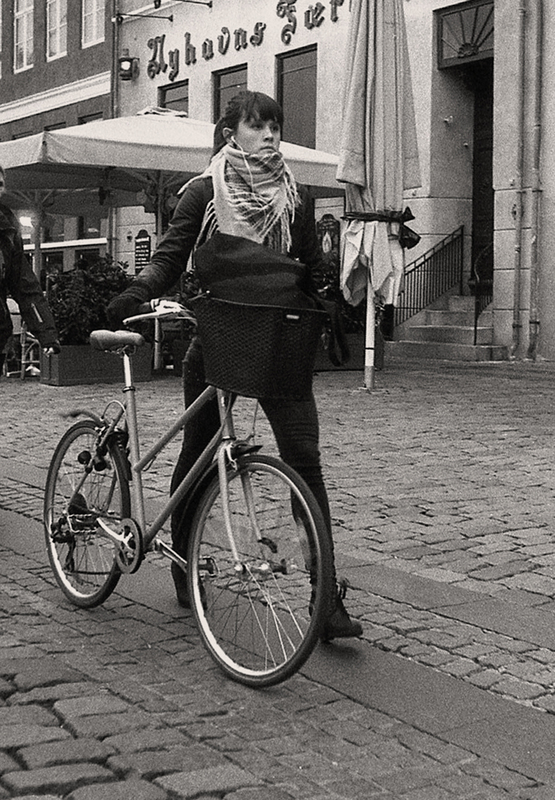 Colville-Andersen’s Cycle Chic blog champions stylish urban bike culture; he argues that “Copenhageners have demystified the bicycle and use it without any form of bicycle ‘gear,’” a dig at cycling style dominated by lycra, skin-tight jerseys, and helmets. Cycle Chic comes armed with its own pretentious manifesto including the directive that “I will refrain from wearing and owning any form of ‘cycle wear.’” Sociologist Dave Horton sounds much the same tone about cycling fear, but he acknowledges that anxiety about cycling is an emotional apprehension of accidents as well as the uncertainties of being a rider in public space. He laments that cycling anxieties are symptomatic of a broader “culture of fear,” with the apprehensions fostered by helmet laws typical of our deep-seated dread of everyday social life. Colville-Andersen secured international media coverage this year with his shallow ethnographic analysis that “it’s an interesting cultural question as to why, in Anglo Saxon countries, there’s this almost pornographic obsession with safety, whereas in France and Spain they don’t promote helmets.” For Colville-Andersen, the confidence in helmets is misplaced faith fueled by “fanatic safety nannies” and overwrought emotion. In 2008, Colville-Andersen’s Copenhagenize exhausted the metaphorical link between faith and helmet rhetoric when he suggested that “people insist on sticking to their beliefs that they are wearing a polystyrene, all-powerful halo that wards off all traffic evils and will ensure a long, healthy life.” He theatrically refuses to cycle in Australia in protest of compulsory helmet laws, arguing that “Australia is held up as the example of how helmet laws destroy urban cycling.” Colville-Andersen’s desire to cycle without the imposition of an intrusive state perhaps strikes a populist sentiment allowing him to unleash his long locks and wear trendy clothes, but his assessment of the social and material conditions of cycling in America at least is fundamentally flawed. 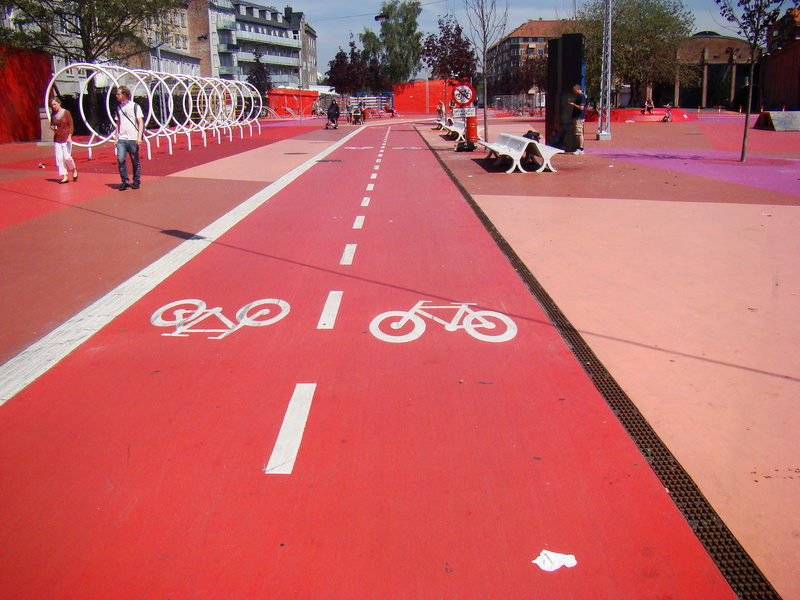 A Copenhagen bike lane (image Cian Ginty). Apparently Copenhagen’s cyclists are all aspiring to be stylish (image from windy_). Cars are the most dangerous element of the transportation system. Bikes simply risk disrupting motorists’ programmed if not automatic sense of movement, speed, and sight undone by a 15-mile per hour bike. Nevertheless, cyclists tend to be blamed for most accidents, either for explicitly failing to follow the rules of the road or more often because the bike is on the road at all “creating” a dangerous situation. Bikes are socially constructed as dangerous to relieve drivers’ own deep-seated anxiety that a cyclist is vulnerable and forced to trust in the skills of drivers hesitant to shoulder the responsibility for others on the road. Rhetorically making bikes the source of danger clumsily relieves drivers of responsibility. I have never been especially fearful of cars: I follow the rules of the road religiously, ride predictably, and I wear a helmet should I fall, which is far more likely than being hit by a car. But this week a car hit me nearly head on, throwing me across the hood and into the windshield. I was going 21 miles an hour (recorded by my Garmin), and I crushed the windshield with my helmet and shoulder, an impact that broke my clavicle and scapula and registered a host of scrapes and soreness. In the emergency room by some terrible twist of fate three cycling injuries were receiving treatment, and the other two received skull fractures in falls without helmets. My experience is simply impressionistic and individual, with my Specialized S Works helmet actually pressed well beyond the tolerance expected of a bike helmet. Colville-Andersen and those critics suspicious of helmets and the state’s intrusion into their lives will never be swayed by any amount of data, despite persistent lamentations over the hysteria of helmet advocates. To champion helmets is to acknowledge that falling on a bike is very different than falling while running or walking, and most falls are low-speed without the dramatic impact I survived. Colville-Andersen’s tortured defense of cycling chic being undone by helmets proselytizes over lycra and dismisses bikes as sport, recreation, and everyday transportation alike. Posted on November 2, 2013, in Uncategorized and tagged bike helmets, Copenhagenize, cycling. Bookmark the permalink. 8 Comments. Get well soon. Glad you were wearing your helmet. Your portrayal of Colville-Andersen suggests someone unaware of family dynamics. “At least I looked cool when I died” is no solace to the grieving family of a young adult. I’ve heard the argument about the cyclist feeling invincible or the drivers regarding them as protected when they have a helmet. I’m not sure if I believe it. I never feel invincible cycling on a road. I don’t like wearing a helmet but the one time I had a serious accident (when someone opened a car door without looking and I went over it) I was very glad I had the helmet. I walked away with bad bruising and a lot of aches and pains. Without the helmet it could have been a lot worse. I tend to think that cars are much harder on the human body than the body on cars. And I would also like to preserve my brains for future use. Thus I wear a helmet. Fantasies of invincibility when wearing one? Even a suit of armor would not stop an injury when one is hit by a car. But I could be wrong. I agree that there is a huge difference between cycling and driving cultures in Northern Europe and the United States, especially where I live in Metro Detroit.Sometimes cars don’t even stop for foot pedestrians and there’s a proliferation of streets here that are nearly impossible to cross without a car. When visiting my boyfriend in The Netherlands, the most bike friendly country on earth, it’s like night and day from what I’m used to. Growing up having never seen a bike lane, I was amazed at how integrated bike lanes were into the Dutch infrastructure. Also, Dutch drivers expect to share the road with cyclists whereas in America they’re seen as a nuisance. On the subject of helmets, I don’t recall ever seeing a Dutch cyclist with a helmet but they’re more common in America, perhaps because, again, they sense that what they are doing is dangerous. Some great pictures and artwork here, along with some real insight into our attraction to dystopian themes. Fantastic! I enjoyed the artwork and your analysis.